With the JMP Battery Monitor II and the new and free Apple or Android app "JMP BatteryMonitor II", you can quickly and easily check the state of charge of your battery. Full capacity and usability can only be guaranteed if the battery has a constant, positive state of charge. The positive state of charge also prevents any premature damage or failure of the battery. The continuous recording allows the state of charge of the battery to be recorded during journeys and can also be called up later. The file with the data can be sent by email from the smartphone and displayed in Excel. So you can quickly see where the charging voltage has dropped or was too high. A defective regulator can be quickly detected above it. In addition, the new app can also be used to check start processes (starter, cable connections, etc.) 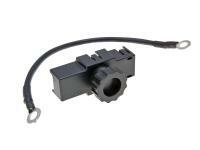 and charging processes (alternator, cable, etc.). This saves time in troubleshooting. In case of low battery or other problems, a notification can warn the driver depending on the setting in the app options. After the simple connection to the battery by means of ring eyelets and downloading the new Android or Apple app, the current voltage value can be called up. The transmitter can be used for 6V and 12V batteries. The range is approx. 10 metres. 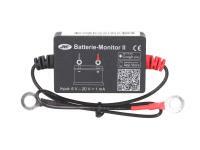 Please note: For the new JMP BatteryMonitor II the new app "JMP BatteryMonitor II" is required! voltage recording even while driving. Result can be sent by email. Display of the file in Excel possible. Note: Smartphone or Tablet not included. The illustration is only for demonstrating the software!